Beautifully engraved certificate from the Voyager.net issued in 2000. This historic document was printed by the Security-Columbian Banknote Company and has an ornate border around it. This item has the printed signatures of the Company's President and Chief Executive Officer, and Secretary. This is the first time we have had this company's certificate for sale. Voyager.net was the largest full-service Internet communications company focused on the Midwestern United States, with over 365,000 subscribers. Voyager.net provided high-speed data communications services and Internet access to residential and business customers. Services included broadband Digital Subscriber Line (DSL) dedicated business connectivity, cable modem access, dial-up Internet access, Web hosting, electronic commerce, server co-location and long distance phone services. The Company operated the largest dial-up Internet network in the Midwest in terms of geographic coverage, with approximately 200 Voyager.net-owned points of presence in Michigan, Wisconsin, Ohio, Illinois, Indiana and Minnesota. Voyager.net had CLEC (Competitive Local Exchange Carrier) status in Michigan, Ohio and Wisconsin. 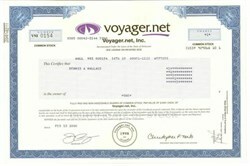 On September 29, 2000, CoreComm completed its of Voyager.net. CoreComm is an innovative communications company that provides integrated telephone, Internet and data services to business and residential customers in targeted markets throughout the United States. We are exploiting the convergence of telecommunications and information services through a smart build strategy, which involves the ownership of switches and related equipment for the provisioning of services, and the leasing of the unbundled local loop, combined with the provisioning of an IP-based, national network. This configuration of local and national owned and leased facilities allows us to deliver a wide range of communications services over a network architecture that we design to be capital efficient and primarily requires success-based incremental capital. Our goal is to expand our facilities, geography and services to become a leading switch-based communications provider in selected major markets across the United States. In addition, CoreComm has formed FiberCo., a new subsidiary which is planning the installation of a broadband, IP-centric network in the New York metropolitan area.